The way the diamonds stand out among the triple layers of black cable ropes in this bracelet is a sign how you would stand out among the crowds by wearing this bracelet. 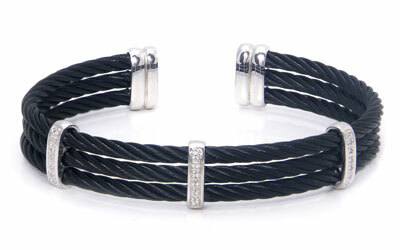 With the lines of silver and diamonds on the black ropes, this bracelet looks very stylish. While it fits perfectly for parties and casual event, sometimes you can slip it into semi-formal occasions too.